Pickup from Chandigarh Chandigarh proceed to Manali (290 kms/9 hrs) Manali is a perfect hill station covered with snow-mountains and beautiful waterfalls, on arrival check in at hotel - Dinner and overnight at Manali. After Breakfast proceed for Sarchu, cross through Rohtang Pass, overnight stay in srchu. Early morning Leave for Tsomoriri, enter to Lahaul Valley, visit Raja Gyepan temple at Sissu Village, lunch at Keylong later leave for Jispa, cross Baralacha Pass (16020 ft) a beautiful drive on high altitude to be remembered for life time through Nakeela and Lachangla Pass 16,617 ft. After Pang drive to Tsomoriri O/N Tsomoriri. After Breakfast leave for Pangong Lake 14,500ft, through Changla Pass 17,350ft. (Third Highest Motor able road in the world), Arrival at Camp, Later free time at Leisure and enjoy the color changing lake and the sun set on the banks of lake. O/N On the banks of Pangong Lake. Start your day early when the surroundings of the lake look even more beautiful. If you want, you can click some photographs here. Later on, start driving towards Tsomoriri Lake. 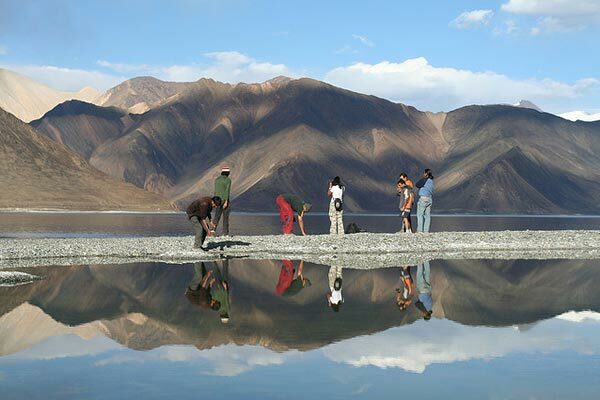 The largest lake in Ladakh, it lies at an altitude of 15075 feet. 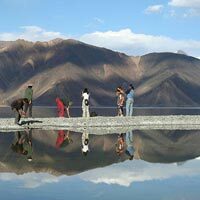 You drive up to Kharu and then right to the Moriri Lake. En-route halt at Chumathang Hot springs. Drive past Mahe Bridge and then drive towards the beautiful Tsomoriri Lake. Spot Himalayan marmots. Evening arrival at the Lake. Check-in at the tented camp near the lake. Near the lake, you can spot as many as 34 avifauna species. The lake has been declared a Wetland of international significance under the Ramsar Convention in 2003. The day is going to be full of action. Your first visit is to region with Lunar landscapes- an area that is similar to the land condition of Moon. After this, you visit Lamayuru Monastery- one of the largest and oldest monasteries in Ladakh, it houses wall paintings, thangkas, murals, old scriptures and various statues of different forms of Buddha as well as other deities. Next you explore Rizong Nunnery- residence of 40 monks, this monastery was constructed in 1831 by the great Lama Tsultim Nima (130 km round trip / 6-7 hours). If you want, you can also enjoy a day hike to Rizong village (around 2-3 hours) or a go for a short hike to Gera-Lardo village across Indus River. Today, you start driving back to Leh. On the way, halt to visit Spituk Monastery- also known as Pethup Gompa, it was founded in the 11th century; Magnetic Hill or the gravity hill-a natural wonder of the region and the Military Hall of Fame- a museum and memorial of the war heroes that is established and managed by the Indian Army. Late afternoon arrival in Leh. As the rest of the day is free, you can indulge in some last minute shopping at the popular markets of Leh such as Moti market, Balkhang chowk for apricot and Super Market.